An intrepid world traveler most likely won’t find a tour of central Asia daunting, but others just might. Unless you are accustomed to dealing with border crossing that require schlepping all your personal baggage across long no-man’s land—barbed wire fences, check points manned by steely-eyed soldiers carrying rifle, some with fixed bayonets, that speak no English—this would be the lowlight of the tour you don’t need. Ironically, central Asia used to be a vast, open but loosely defined region that separated the European kingdoms in the west and the mysterious Cathay in the east. Today, this region is artificially divided into countries, all ending in “-stan:” Kazakhstan, Kyrgyzstan, Tajikistan, Turkmenistan and Uzbekistan. (Afghanistan is also part of Central Asia, but not presently recommended for even the intrepid traveler.) The Stans became independent countries upon the dissolution of Soviet Union in 1991 and they apparently took the borders created for them by Stalin in the 1920’s very seriously. Crossing from one Stan to another is strictly monitored and controlled. Before spending three weeks visiting the “5 Stans,” I thought of central Asia as a place of camel caravans trekking over endless deserts. I was to find the image off the mark. While the western part of central Asia is arid and dominated by deserts, the eastern part contains snow-capped mountain ranges, tree-ringed alpine lakes, lush valleys and rivers nurturing vast grasslands. Mother nature made sure I revised my understanding of central Asia by drenching my travel companions and me in sudden torrential downpour while we were in Tashkent, Samarkand and Ashgabat, about 1000 miles apart. This part of the world was home to fabled empires at different times and overlapping territories that belonged to such ancient people as Scythians, Parthians, Sogdians, Bactrians and Kushans. Much of their cultures have been lost over time abetted periodically by total massacre and destruction in the hands of ruthless invaders resulting in a consequent loss of historical continuity. It shouldn’t be surprising—though I was initially—that we found frequent mention of Chinese sources to establish and authenticate the archeological finds on display in the museums we visited. Neighboring China, after all, has uninterrupted historical records that kept track of the interactions China had with various peoples in the west. One of the museums attributed “the ambassador from China in 109 BC” as the beginning of trading on the Silk Road between China through central Asia and the West. I was thrilled by this apparent reference to Zhang Qian, the emissary sent by Han Wudi to form alliances with the kingdoms in central Asia. Zhang Qian is an important historical figure well known to school children in China. At first I thought the reference was an independent validation of the years he spent in central Asia, but upon further reflection, I asked myself, was it merely another citation of the same Chinese historical source? Invasion by Alexander from Macedon around 330 BC became the first major defining event for this region. In his campaign against the Persian Empire, he ran over most of central Asia in part because his opponents didn’t know how to overcome soldiers marching in phalanx formation, the leading warfare technology in its day. When he got to the capital of Sogdiana, near today’s Khujand in Tajikistan—as the local guide related to us—he met fierce resistance, which he solved by marrying Roxanne, the princess of the local king. Thus a romantic story from the ancient era was born. The influence of Greek culture to central Asia and beyond to India and China can be attributed to Alexander’s conquest. The Arabs invaded this region in the 7th century and conversion of the people to Islam began. The Arabs also introduced great Islamic architecture and science and mathematics, the former such as the invention of the double dome structure found in mosques, mausoleums and madrassas. The many structures we saw were ancestors to the Taj Mahal built in India many hundred years later. 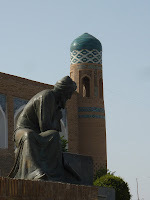 Khiva proudly displays a stature of al-Khwarizmi, who wrote the definitive book on algebra, as their native son. 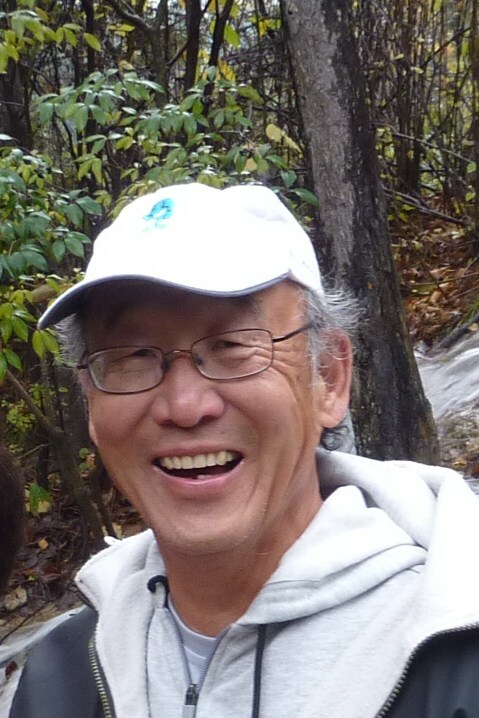 The word algorithm in computer science was derived from his name. The Mongolian invasion led by Genghis Khan in the 12th century was the next cataclysmic disaster to strike this region. He left a wake of annihilation and destruction in his path as he swept through on his way to Europe. Much the memory of the people and evidence of their culture were erased by the Mongols. Our guide in Kunya Urgench explained that the tragic outcome could have been averted save for a grievous misunderstanding. Genghis Khan had sent emissaries to the emir then seated near Kunya Urgench to establish trade relations. The emir got bad counsel and looked down on the unwashed horsemen and beheaded them. A furious Genghis then mounted a fierce assault that eventually overcame the fortress. Annihilation of the population and leveling of the city was a customary practice to intimidate the next opponent and convince them that surrender to avoid slaughter was a wiser alternative. Genghis was not the first to use this practice. Alexander did the same some 1500 years earlier when he invaded southern parts of Greece. The next ruthless ruler to dominate central Asia was Timur, whose detractors derisively called Timur the lame, which in the West became Tamerlane. Timur was home grown from a village outside of Samarkand who rose to conquer much of this region roughly a century and a half after Genghis Khan. He made Samarkand his capitol and built a great city for posterity. He also destroyed other cities and kingdoms that rivaled his power, such as the kingdom of Khorezm based in Khiva. At its peak, Timur’s empire rival in size to that of Genghis Khan and Alexander. In 1405, nearing 70, he died on the road as he was preparing to invade China. The threat of his invasion was said to lead to Cheng Ho’s sailing the seven seas as the Ming Emperor sought alliances that might mitigate the threat of Timur. Peter the Great had designs on this region as early as 1717 but took the Russian military another 150 years to conquer and incorporate central Asia into its empire. After the Bolshevik Revolution, central Asia became part of USSR. To discourage insurrection and large-scale rebellion, Stalin somewhat arbitrarily divided this region into the aforementioned 5 Stans. At the time, each autonomous region had to have a minimum 1 million population and over 50% belonging to one ethnic group, such as Kazakh, Kyrgyz, Tajik, Turkmen and Uzbek. Some of the borders, reminiscent of the fine art of gerrymandering in the US, reflect the need to meet the criteria. Central Asia was the prize Russia won in the Great Game over Great Britain. There were pluses and minuses attributable to their occupation. Under Tsarist Russia, there weren’t much respect paid to the cultural artifacts and madrassas, for example, were converted from being religious schools to stables and warehouses. The Soviets began to paid attention to the artifacts buried in the many ruins in central Asia and excavate some of these sites. Much of World Heritage sites and other archeological gems that we can see today owe their existence to the recovery and restoration efforts by Soviet archeologists. On the other hand, just as some of the finest art found in British colonial past are in the British Museum in London, so it is that some of the best finds in central Asia are on display in the Hermitage in St. Petersburg. 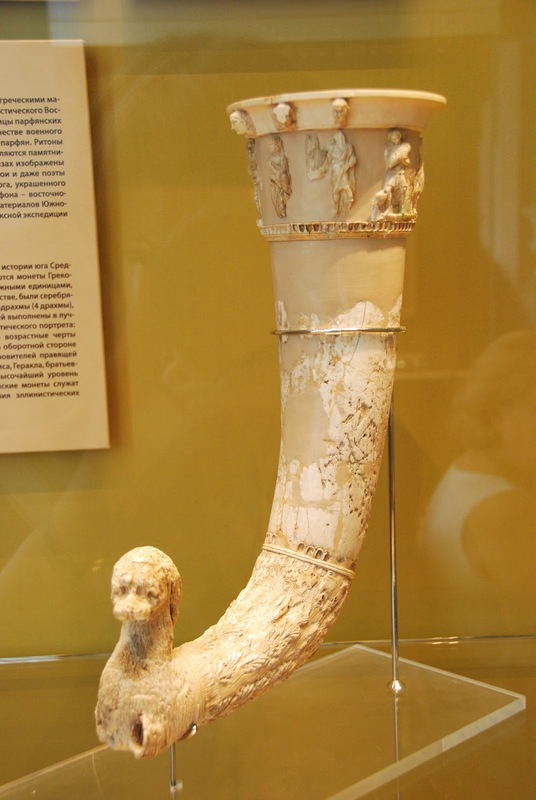 The ivory rhyton at right was found from the Nisa ruins outside of Ashgabat, now on display at the Hermitage, similar ones are also on display at the National Museum of History in Ashgabat. The preceding sketch of the history of this region is no where comprehensive and perhaps not even precise but is, I believe, a minimum framework necessary to understand today’s central Asia. On the tour, the most striking thing I noticed was the people of central Asia. They come in all sizes, shapes and coloration and as non-homogeneous as one can imagine. Some are blond and pale and some look Asian, but most seem to fall in gradations somewhere in between. They could be easily mistaken for someone from Mexico, or Morocco or Iran or Egypt or India or Italy. Remarkably, they mix and mingle and seem oblivious to differences between themselves. I could not detect any ethnic sensitivity or tension as we mingle with them on the streets and bazaars. In various times, nomads from Siberia, Mongolia, Manchuria and western China have migrated or passed through from the east, as have people from Russia and Ukraine from the north and Turks and Greeks from the west and Persians from the south. With such a long period of intermingling, perhaps it’s natural that they stopped noticing the differences among themselves. Even though the dominant religion is Islam, the people’s attitude is quite secular. Few pray five times a day, most consider themselves devout if they regularly pray on Fridays. During the three weeks we were there, we did not hear the call to prayer even once, unlike our experience in other Islamic countries. Perhaps this is a legacy from the Soviet era when practice of religion was actively discouraged. The sudden dissolution of the Soviet Union seemed to have left the Stans poorly prepared for nationhood. All gravitated to some form of strong man government, and, except for Kyrgyzstan, have enjoyed the support of the population to varying degrees. In the case of Kyrgyzstan, the first two presidents were thrown out of office, the third, a woman, accepted the emergency appointment for one year and voluntarily stepped down for the next elected president. Economic development among the 5 Stans seems uneven, largely dependent on whether or not the particular country possesses deposits of oil and gas to subsidize the economy. Kazakhstan and Turkmenistan have plenty of oil and gas and thus have stable economies. Uzbekistan does not and is wrestling with ongoing inflation. The official exchange rate is 1800 som to a dollar. At restaurants, if you offer to pay in dollars, they offer a black market rate as high as 2850 to a dollar. Kyrgyzstan is rich in water and natural scenery and Tajikistan is the least economically developed of the five. Uzbekistan’s attempt to control inflation is apparently to exert tight monetary control. We were told that the daily receipts of enterprises, large and small, are collected by the state at the end of the day and deposited in the state-owned banks. This would allow the state to monitor and control the circulation of their currency but apparently the state can’t help resorting to printing more currencies as their remedy. The consequence is that everybody carry wads of 1,000 som bills and are experts at counting stacks of bills quickly and accurately. On a flight from Urgench to Tashkent, I happened to stand next the interpreter for a World Bank team visiting the country. I asked her if the World Bank was recommending an open economy that welcomes foreign direct investment, she agreed that would be a step forward. China’s influence in the local economies is readily evident. The bathroom amenities as well as the sinks and toilet bowls in many hotels are from China. In the bazaars, used fertilizer bags from China are popular for holding whatever commodities the stall operator is selling. In Bishkek, I bought an electrical plug converter for the equivalent of $1.10, made in China of course. That little purchase was essential to power my iPad, mobile phone and camera for the rest of my trip. The roads in 5 Stans are extremely uneven. New roads are excellent. A JV, we were told, built the toll road from the border to Khujand in Tajikistan, with a Chinese company. While driving from Bishkek to Lake Issyk-Kye, we were mostly on a road still under construction. When completed, it was going to be a major arterial highway from Kyrgyzstan to China. At a roadside restaurant, I was delighted to take over from our guide and ordered a Chinese meal from a menu with dishes written in Chinese. This part of the world has not seen many tourists from America. When they asked and found out that we were from the US, we were invariably greeted with warm, welcoming smiles. In Uzbekistan, especially the young people loved to have their photos taken with us, the American tourists, and they would frequently approach the women of our group and ask for group photos with us. We felt like celebrities. The people in Tajikistan loved to have their photos taken by our camera and were pleased to see their images on our camera. The people of Turkmenistan were more formal and distant and did not encourage taking of photos. Driving into Ashgabat, we saw gleaming white marble office buildings, white marble apartment towers, spectacular monuments, broad boulevards and fountains everywhere. Being the capitol of Turkmenistan, Ashgabat was probably the most ostentatious, but the other major cities that we drove through also contained spectacularly looking edifices. On the other hand, the highways between the cities are not in good condition and rather than drive, it was quite inexpensive to fly, under $20 per person from Mary to Ashgabat and from Ashgabat to Dashogus. Fuel in oil-rich Turkmenistan must be quite cheap. When we got to Samarkand, one of the first stops was to visit a family still making paper from the fibers of the mulberry tree in the traditional way, i.e., by manual labor. I found an interesting historical footnote related to this stop. I discovered that Samarkand was the first place to make paper outside of China and they learned papermaking from the Chinese prisoners of war because of a pivotal battle that took place in 751 AD. Taking place in the valley of Talas in today’s Kyrgyzstan, a force of soldiers from Tang court fought a force led by the Arabs. The Chinese suffered a devastating defeat as some 2000 soldiers were taken prisoner; among them were skilled craftsmen who knew how to make paper and pottery. Thus was how the papermaking technology was transferred to the west. While largely forgotten, it has been argued that this battle had a major impact on history. After this battle, the Tang court turned away from central Asia and lost interest in advancing its sphere of influence westward. Even though the Arabs won the battle, the logistical challenge of supporting their army over great distances may have also discourage their expansionary ambitions. They too turned away to consolidate their control in central Asia. I recently came across an article that discussed this historic battle more fully here. All the electrical outlets use the two round pin configuration. If you don’t have an adapter at home, you can easily buy one in bazaars and street-side stalls upon arrival. Most of the major stops on the Silk Road are in Uzbekistan. So if you would rather not deal with the hassle of crossing borders by foot, just book your tour for Uzbekistan. As you enter Uzbekistan be ready to accurately complete the customs form and declare the amount of currency you are bringing in. Avoid hassle by making sure that you report no increase in the amount of currency you are taking out on departure. Travel as light as you can and make sure your luggage has sturdy wheels. Perhaps because of perceived threat to airport security, cars and buses are not allowed to drive up to the terminal door. Instead, you are dropped off some distance away and have to haul your luggage to the terminal. Bring plenty of US currency in small denominations, which will be handy to make purchases and as gratuity. The bills should be in good condition free from tears and unsightly wrinkles. Hygiene standards are quite high everywhere we went. We ate fresh fruits, cucumbers and tomatoes and none of us got sick. Do bring along an umbrella. We booked our tour with East Site Travel, based in New Jersey with offices in the 5 Stans. You will find their website interesting and informative. For those of you interested in more photos and less verbiage, I have produced a photo book on Shutterfly that you are welcome to access and view. Great blog. I remember that when we were on the silk road trip that there were indication of much Chinese construction linking Stans to China. What percentage is the Chinese trade related to these Stans GDP now? WoooW!!! Want to visit such incredible place ... love your blog.